Those of us researching Scottish surnames beginning with either Mac or Mc quickly become aware of the additional challenges these names can bring for search engines, record indexes and genealogy & family history databases. Wandering around a cemetery in Ayrshire recently (it's an occupational pleasure or hazard!) I came across a headstone which showed this isn't a new problem. When the headstone was first erected in memory of their daughter in 1889, Robert and Elizabeth's surname is recorded as MACMILLAN. By the time of Elizabeth's death in 1899, the name is inscribed as McMILLAN. So which one should it be? Mac originally meant "son of". The second part could be the father's name (Macdonald), occupation (Macnab) or perhaps a distinguishing feature such as hair colour. The last of these gave rise to McMillan, son of the bald one or the tonsured one. For many earlier records, and even throughout the nineteenth century in Scottish newspapers, the names were often written as M' (such as M'Millan). In early records you might also come across N' or Nc for women, meaning "daughter of" - for example, the Argyll Register of Testaments for 1686 refers to Christian N'Millan, spouse to John M'Cay in Auchusavill, parish of Saddell. At a time when many people couldn't read or write, an individual may not have known how to spell their surname or even worried about it very much, so how it was recorded was very much dependent on who was writing it down. This was particularly true in census returns, and also for those with "foreign" names. 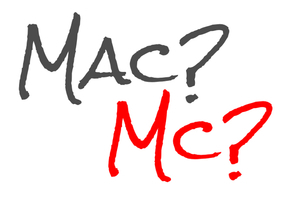 The ScotlandsPeople website doesn't differentiate between Mac and Mc. If you search for McMillan, Macmillan will automatically be included in your search results. The ScotlandsPeople Centre system searches slightly differently, so you will need to allow for both forms in your search term (use M*cmillan, for example). UPDATE: the new ScotlandsPeople website now does differentiate between Mac and Mc, so you will need to use a wildcard to look for both. Searching for McKinven birth register entries for 1855 to 2016 gives 833 records, for Mackinven gives 68 records and for M*ckinven gives 901 records - fortunately for all concerned! 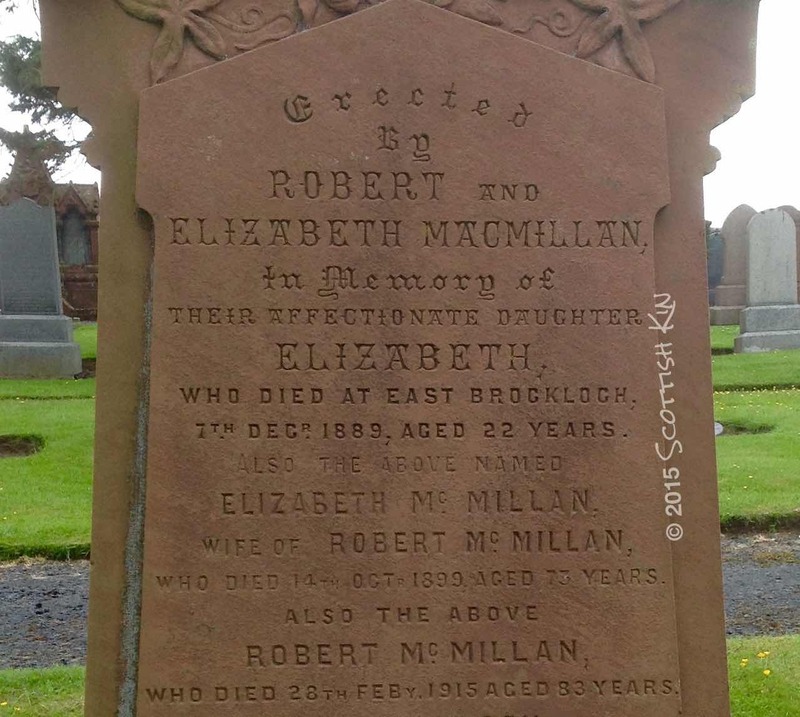 Robert McMillan, son of Thomas and Jane (maiden name Gregg) was a ploughman who married Elizabeth Cowan, daughter of William and Elizabeth (maiden name McGauchie) on 3rd June 1857 at Brockloch Farm near Maybole in Ayrshire. When Elizabeth's father died in 1874, Robert and Elizabeth returned to East Brockloch to run the farm. Curiously Robert's death record in 1915 shows his date of death as 24th February (as does his will) rather than 28th February as given on the headstone. It all just shows that you can't believe everything you see on a headstone! Marriages Scotland. Robert McMILLAN and Elizabeth COWAN. 1857. Maybole, Ayrshire. 605/00 0012 / Deaths Scotland. William COWAN. 1874. Maybole, Ayrshire. 605/00 0064 / Deaths Scotland. Robert McMILLAN. 1915. Maybole, Ayrshire. 605/00 0010 / Testamentary records Scotland. Robert McMILLAN. 2 June 1915. Ayr Sheriff Court Wills. SC6/46/42 and SC6/44/76. Executrix: A female executor of a will, who carried out the wishes of the person who made the will. These [records] are fascinating, and it's good to know that that batch of family stories ties up!